Yet another "de-stash" Valentines Day DIY. I'm not usually someone who likes heart shaped things, and I really don't care for foam stickers. BUT - I do love these adhesive foam hearts that I got from the dollar store. Are you having a Valentines Day brunch? Serve up some fun drinks to your guests by giving plastic glasses a quick makeover! All I did was stick a foam heart on the front of the glasses and I think it really transformed the whole look. 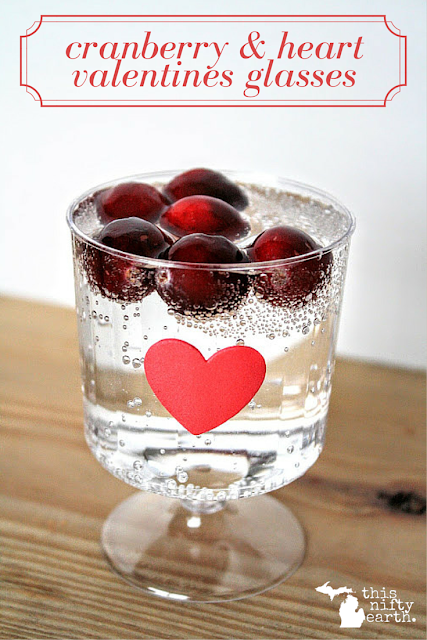 Add a few cranberries for a garnish and you have a simple addition to your Valentines Day tablescape.